As we prepare for the transition to the Patient-Driven Payment Model (PDPM), which is expected to occur on October 1, 2019, we have been reviewing the primary components that make up the Case Mix Index (CMI) for reimbursement. Previous articles in this series outlined the physical and occupational therapy component and the speech language pathology component. In this article, we discuss the non-therapy ancillary (NTA) component. The NTA component, together with the nursing and non-case mix components, make up the total reimbursement for a patient day under Medicare Part A.
NTA classification is based on the presence of certain comorbidities or use of certain extensive services. The Centers for Medicare & Medicaid Services (CMS) realizes that the cost impact of medications, at the time of admission, is extensive. The more comorbidities a patient has, the more medications he or she probably requires. The PDPM classification system is based on support of the patient’s characteristics. The idea is that the facility should be paid for the care they are delivering, based on the patient’s characteristics. Under PDPM, CMS identified 50 conditions that were related to increases in NTA costs for a skilled nursing facility (SNF). These conditions, along with the number of points associated with the condition and how it is reported, can be found by downloading the CMS document titled “Fact Sheet: NTA Comorbidity Score. The NTA comorbidity score is a weighted count of certain comorbidities that a SNF patient has, which is then used to classify the patient into an NTA component payment group. Comorbidities associated with higher increases in NTA costs are grouped into higher point tiers, while those that are associated with lower increases in NTA costs are grouped into lower point tiers. The individual NTA conditions have points ranging from 1 to 8. The provider will report on the Minimum Data Set (MDS) each of the comorbidities that a person has. The patient’s NTA comorbidity score is the sum of the points associated with each relevant comorbidity. The list includes diagnosis codes, which will be recorded in the I8000 section of the MDS. Other specific items will be recorded in various parts of the MDS including Section K, M, N, and O. It will be imperative that the coding is accurate on the MDS for the NTA conditions. Documentation by the physician and nursing must also support the skilled nature of the codes that are recorded as NTA conditions. The table below shows how the sum of the NTA points converts to an NTA Case Mix Group and a corresponding NTA CMI. This NTA CMI is added to the other components to calculate the total reimbursement for the patient. One can see from the table above that if comorbidities are missed, the facility could possibly miss out on reimbursement. For example, if the MDS Coordinator counts only two of the three comorbidities that a patient has, the CMI for NTA would be 0.96 instead of 1.34. This could be a difference of $29.23 per day for Urban and $27.93 per day for a Rural facility. There is also the impact of the Variable Per Diem Adjustment Factor that is applied to the NTA Component. For RUGs IV PPS, the payment is based on a per diem rate that is constant for the entire length of stay. Under PDPM, an adjustment is applied to certain PDPM components that varies the per diem payment over the course of the stay. For the NTA component, the CMI is multiplied against the applicable per diem adjustment factor and is then applied to determine the case-mix adjusted payment associated with each of these payment components for each utilization day under PDPM. For the NTA, an adjustment factor of 3.0 is applied to the total NTA CMI for days 1-3. This is to offset the high cost of medications and supplies that would be required to support the patient characteristics with these NTA conditions upon admission. When the variable per diem adjustment is applied, the increase NTA component goes up 3x; in the example above, the daily rate for days 1-3 would increase by $87.70 for Urban and $83.78 for Rural. This is an important financial consideration that facilities will not be able to afford to miss out on because of sloppy documentation or review of the records. Of importance to note is the condition of HIV/AIDS under the NTA component. As outlined in the SNF PDPM technical report, CMS was looking for the new reimbursement plan to account accurately and appropriately for the increased costs associated with caring for patients with AIDS. This has been a key consideration in designing the various elements of the new model. Research indicated that for those SNF patients with AIDS, NTA costs per day were 151% higher and wage-weighted nursing staff time was 18% greater than for other patients. 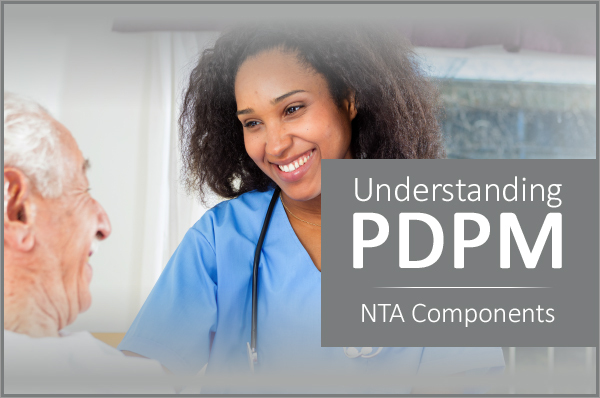 As a result, patients with AIDS are assigned the highest point value (8 points) of any condition or service for purposes of classification under the PDPM’s NTA component, and they also receive a special 18% add-on to the nursing component of the payment. As under the previous RUG-IV model, the presence of an AIDS diagnosis continues to be identified through the SNF’s entry of ICD-10-CM code B20 on the claim. In summary, the NTA component is an important component to capture and reimburse the facility for costly medications and supplies that are needed to support patient characteristics. The correct coding for NTA will require a team effort and diligent review of coding and supporting documentation to ensure 100% accuracy. For more information on preparing for the transition to PDPM, register for our 9-Part PDPM Webinar Series.